Lenovo 3000 J105 is the first Lenovo-branded computer that launches worldwide since Lenovo acquired IBM personal computer division. 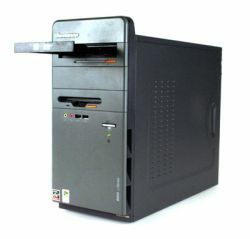 Lenovo 3000 J105 is also a first Lenovo computer that powered with AMD CPU. The budget computer doesn’t have PCIe, replaced it with old technology PCI instead, where you can plug in ultra cheap sound and display card, and extra Lenovo Care that based on ThinkVantage technology. Bottom Line: It may be odd to see an AMD chip in a business PC, but the Lenovo 3000 J105 surprises us with an attractive yet low-cost desktop for the home office. Pros: Quiet. Inexpensive. Includes business-oriented software and utilities. ThinkVantage Rescue and Recovery. Cons: No PCIe card slots. Included Norton Internet Security subscription lasts for just 90 days.